Brand Name: Sentry Industries Inc. This is a feature-packed project planning calculator. With user-friendly prompts and features, you can easily manage and control your jobs. It has heavy duty construction a folding cover, and a long-life battery. 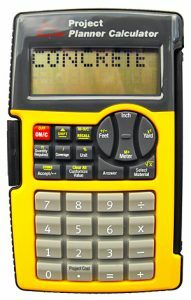 It performs cost and materials calculations in addition to standard calculations. Handles feet, inches, meters and yards. Other features include rubber keys, memory, auto-off and a 7-digit dot matrix display.